Customer Service is something that any service company strives to maintain at a high level and at ExtraDigital we take this very seriously. Of course we sometimes make mistakes, but we aim to keep our clients happy with all aspects of our work – and this includes the quality of the work, the timeliness of the work and the way it is carried out. … it is a measure of how successful the website has been in attracting new customers that we have not sent our comments to you sooner! 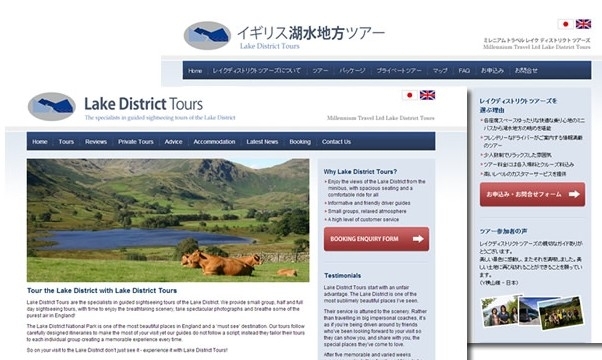 We are very impressed with the rapid turnaround in translation of our website into Chinese that has in the first season of operation generated a lot of positive feedback from Chinese visitors to the Lake District. The design of maps for the website to show off our tours proved to be complicated and required patience on behalf of Emma and her colleagues at ExtraDigital - their implementation of our detailed requirements was excellent. … I'll settle the account by return as you have provided such a fantastic service, thank you.